The Common Core. Now that we've established that you have heard of it before, let's go a little deeper into the topic. We've all heard that our education system is broken, right? Then, one would assume that Common Core would attempt to be the solution to the problem. I have mentioned in numerous posts before that I'm a home school mom, so it shouldn't be surprising to some of you that the article that I'm citing for this particular blog comes from the Home School Legal Defense Association (HSLDA). They came up with their own set of FAQs for Common Core and my intention for this blog was to do that same thing, but I thought, why reinvent the wheel? I'm going to share it with you. The Common Core State Standards (“the Common Core”) are two sets of K–12 academic standards that outline what students are expected to learn in English language arts and mathematics each year from kindergarten through high school. The goal of this checklist is not literacy, proficiency, or increased graduation rates but to make students “college- and career-ready.” The Common Core was written by the National Governors Association (NGA)—an organization of governors, their head staff members, and policy makers—and the Council of Chief State School Officials (CCSSO). States receive Race to the Top (RTTT) federal funding for committing to adopt and implement the Common Core and to collect student data from preschool through the workforce. "..States receive Race to the Top (RTTT) federal funding for committing to adopt and implement the Common Core and to collect student data from preschool through the workforce." The NGA released the Common Core standards on June 2, 2010. Since then, 45 states, four territories, the District of Columbia, and the Department of Defense Education Activity have adopted the Common Core State Standards. Minnesota only adopted the English language arts standards. 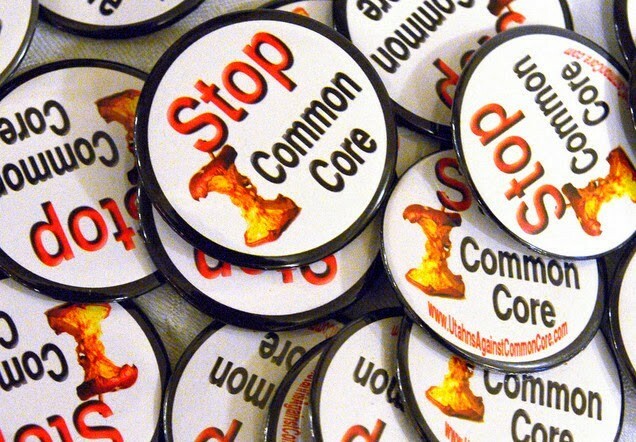 Alaska, Nebraska, Texas, and Virginia have refused to adopt the Common Core. As the pedagogical weakness and ballooning implementation cost of the standards becomes evident, many adopting states are scrambling to delay or defund implementation. So, then you may ask, how is it possible to have the feds involved in this? Federal Funding for Race to the Top is handed out for states whose schools adopt Common Core Standards. See the next question. Three sets of laws prohibit the federal government from prescribing the content of state curricula and assessments, yet the United States Department of Education has propelled the Common Core more than any other organization and is funding the creation of standardized assessments. First, the department conditioned education grants on states’ commitment to implement the Common Core. Second, the department offered waivers from the most burdensome portions of the No Child Left Behind Act in return for states’ promising to adopt the Common Core’s college- and career-readiness standards and corresponding assessments. Third, the department awarded millions of dollars to consortia of states to craft the assessments based on the Common Core. Now, the next question probably addresses the biggest concerns of most moms and dads and news outlets like Fox and talk show hosts such as Glenn Beck, who is addressing the issue with his event to be held next Tuesday, We Will Not Conform LIVE: Making Common Core History. Three philosophical threads weave through the Common Core—statism, moral relativism, and progressivism. The statist goals of the Common Core are implicit in the lockstep uniformity that is the central thesis of the program. Relativism’s influence on the Common Core is evident in the open-ended and research-based assessment questions and the expansive new student tracking systems, ideas which have been strongly promoted by relativist Howard Gardner. Progressive educator John Dewey argued for standardized curriculum to prevent one student from becoming superior to others and envisioned a workforce filled with people of “politically and socially correct attitudes” who would respond to orders without question. Workforce readiness is one of the Common Core’s main goals. Here is an example of the philosophical bias as seen on Fox News with Elisabeth Hasselbeck. This is a segment describing a fifth grade English class and exhibits the statist goals of the Common Core. Take a look. Let's look at the next question. It's a question that I've been concerned about given my personal choice on how to educate my children and the affect that Common Core (if any) will have on them going forward. Sadly, it looks like there might be an impact. Will the Common Core impact private schools and home schools? Implementation instructions for the states written by the authors of the Common Core suggest that a national curriculum is the goal of the standards. NGA recommends that “States and districts…share the costs of developing new curricula and instructional tools and not each develop their own at greater expense for each.” The groundwork for a national curriculum is also being laid by groups of states and private organizations—such as the Gates Foundation and Achieve—collaborating to develop common curricula. Not only has the Common Core not been tested or proven to do what the government and its creators say that Common Core will do, it's proving to be a means of data collection. Goodness knows we need MORE data collection, amirite? See the next question and its answer in its entirety here. All 50 states have had statewide longitudinal databases in place to track their students’ scores on assessments for the past decade. Yet the authors of the Common Core are clear: the success of the standards hinges on the increased collection of student data—including demographics and postsecondary education performance—from preschool through the workforce. Massive new databases are already being built. In 2012, the Gates Foundation used $17 million to launch inBloom, a company that has built a $100 million database to track students from kindergarten through college. The databases identify students by name, address, and sometimes Social Security number. Combined with the changes to FERPA, the implementation of the Common Core is unleashing what is arguably the most comprehensive tracking of citizens that America has ever seen. If that doesn't give you pause, then I'm not sure what will. Sometimes identified by Social Security number??? Remember, the Social Security Card was something that the government assured us would never be used for identification purposes. See question 8 and its answer. Why else would they need all of the data they are collecting? For a national curriculum and to further their agendas and for financial gain!! The article by HSLDA also addresses those who support Common Core and who opposes Common Core and why.